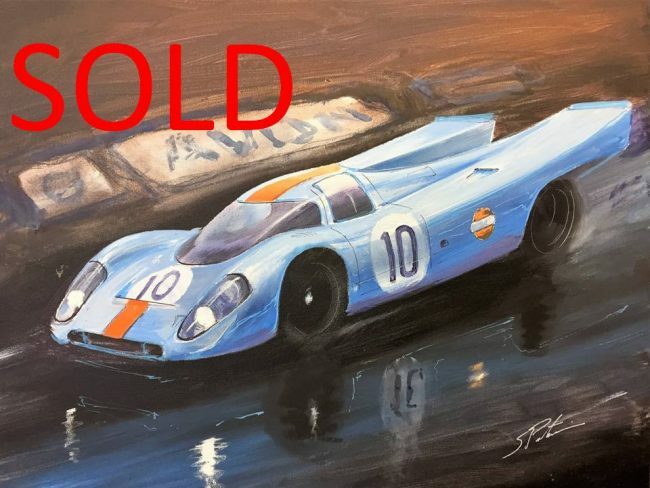 Beautiful original artwork by Steve Pasteiner Sr., of the 1970 Rodrigues/Kinnunen 1000K of Brands Hatch Race winning Porsche 917K. 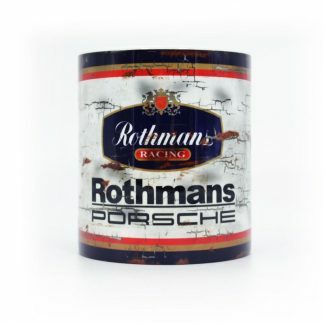 On the day of the race, the conditions were made awful by heavy rain, wind and cold air- a common occurrence during spring in England. The race started with Elford, Jacky Ickx in another works Ferrari, Jo Siffert in works/John Wyer Porsche 917K all getting past Amon around the outside of Paddock Hill, and Amon was followed by Piers Courage in a works Alfa Romeo, Pedro Rodríguez in the other John Wyer Porsche and the rest of the field followed. At the end of the first lap, Barrie Smith in a privately entered Lola crashed heavily on the pit straight, and yellow flags were shown at the site of the accident. Rodriguez, who passed cars while yellow flags were being shown (oblivious to the fact), was shown the black flag and went into the pits while an astonishing 2nd, was reprimanded. Ickx, like Rodriguez- was a wet-weather specialist, had passed Elford and was leading the race. But he soon went into the pits with rain-wiper motor failure. Elford was back in the lead, but the flying Rodriguez, who had come up from coming out of the pits in 12th to 2nd by lap 15 (only about 25 minutes into the race), passed Elford and led the race. This was a lead he kept until the end; he and Elford drove their cars for 5 1/2 of the 6 1/2 hours of the race in the dreadful conditions, and Rodriguez won the race by 5 laps. Porsches romped home 1-2-3-4; the first 3 being 917K’s. Rodriguez’ performance was such that the race is sometimes known as “the day they forgot to tell Pedro it was raining”.